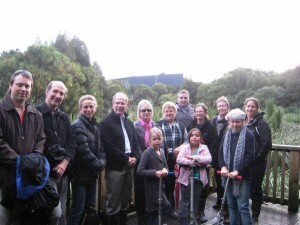 STEPS hosted a walk through the new plantings with Mayor Len Brown on Saturday 11th June. The Mayor displayed a keen interest in both the fundamental sewerage and stormwater issues underlying many of the problems of the upper Meola Creek; and in the recent plantings and boardwalk which fit closely with the vision for “green fingers” extending inland from Watemata and Manukau Harbours. STEPS’ vision for a walkway from our maunga at Owairaka to Te Tokaroa/ Meola Reef on the Waitemata Harbour fits well with this vision and the Local Board Chair and members who accompanied the Mayor extended an invitation to STEPS to review our portfolio of planned projects with them. The Mayor has met with Watercare Services regarding dates for the new Central Interceptor project, and he is now planning to meet with the local business community regarding support for Meola Creek on 9 August 2011. We thank the Mayor for his time and support for this important Auckland stream and ecological area.